PC-1eP Toronto Provincial Debenture $20 (£5) 185_ Face Proof Uncut Sheet of Four Examples PMG Choice Uncirculated 63. An uncut sheet of Face Proofs with the third party back label stating that this sheet is unaffected by issues on the cardstock, followed by the facts of a corner missing and tears. 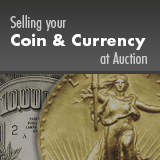 We have only auctioned two items on this rare issuer previously. Our last offering of the two was this exact sheet that brought almost $5,000 in January 2013.